You may have noticed the decorated trees. 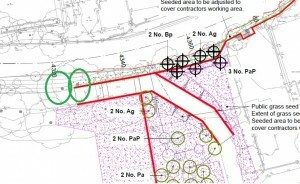 Concerned residents have raised a petition against the removal of trees as part of the upcoming flood works, and especially two of the oldest at the NE entrance (with ovals on the map below). Friends of Roseburn Park have requested a walk through with the project manager to assess the necessity of removing the designated trees. There is some suggestion that some of the removals were needed for the scheme before it was revised and might no longer be required. Whilst we are extremely saddened at the prospect of losing any trees we recognise that local residents have waited some considerable time for action to be taken to improve flood defences. We understand that the designated trees are either in the direct line of building works or are likely to have root damage during the works thus creating a hazard or potential flood risk. Removing trees simply for convenience sake is clearly unacceptable and we will argue strongly against this. We have also been arguing for some of the felled trunks to be retained in the park and incorporated into it to allow children to play on the logs as part of ongoing efforts to work on a new play scheme. This has been thus far opposed by the Council for various reasons. 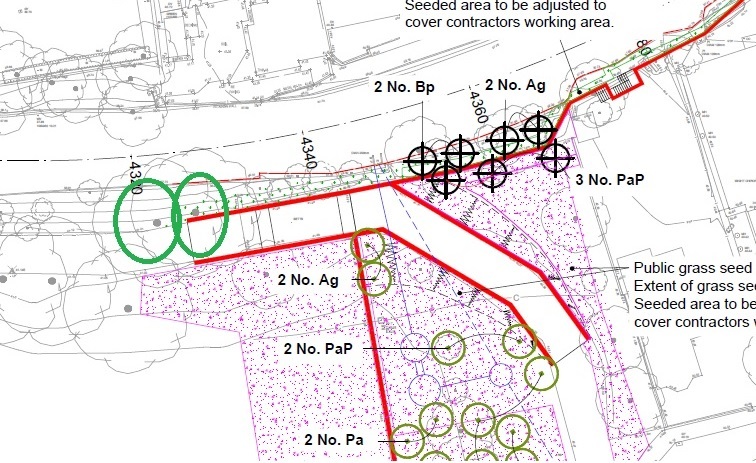 On the plus side the plans include planting more trees than are due to be felled (mature specimens, though obviously not of the age and size of some due to go). All comments are welcome and will be passed to the council. Friends of Roseburn Park recently brought up with City Council our concerns about the use of glyphosates in controlling weeds and borders in the park, particularly around the play area. Glyphosates are the active ingredient in the popular herbicide, Round-up. Recently the World Health Organisation has upgraded glyphosates to “probable carcinogen”, which is the second highest risk category for chemicals in relation to cancer.